News Photo by James Andersen Alpena's Adrianna Gumtow (7) has an attack blocked by Traverse City Central defenders Maggie McCrary (8) and Madison Goodwin during a Big North Conference volleyball match on Wednesday at Alpena High School. Gumtow led Alpena with five kills in a three-set loss. The Alpena High volleyball team showed plenty of fight in its Big North Conference opener. 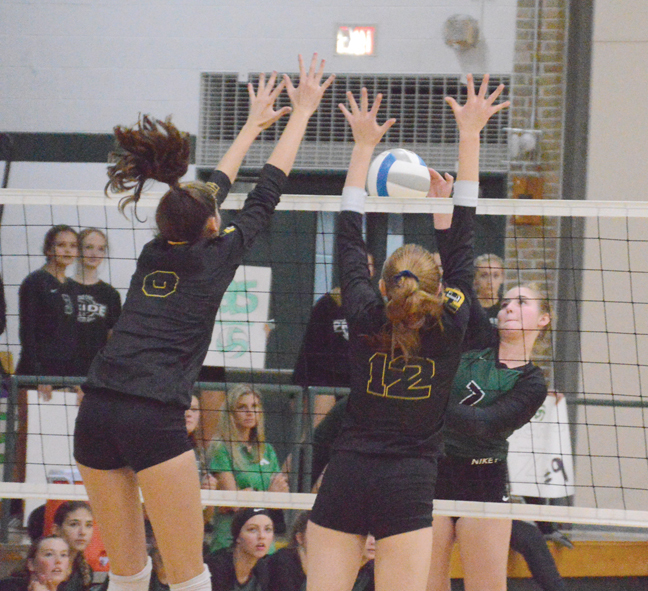 But slow starts in each set and Traverse City Central’s offensive firepower were too much for the Wildcats as they were swept by the Trojans in three sets Wednesday at Alpena High School. Central won 25-17, 25-15 and 25-9. The Wildcats battled back in each of the first two sets, but trailed by at least six points early in each set. 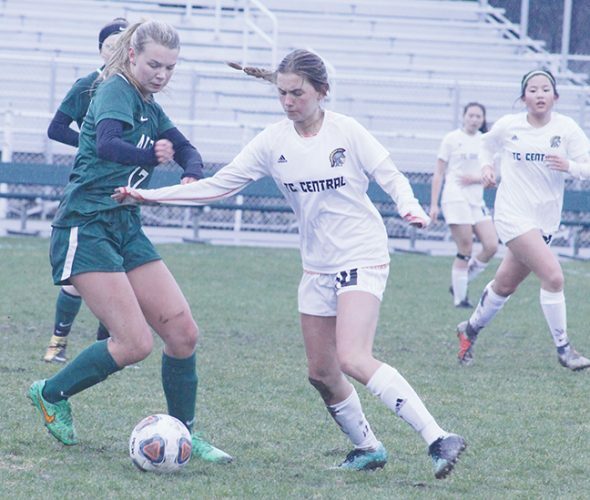 Alpena challenged Central at the net for much of the night, but once the Trojans found their groove they kicked into another gear. Alpena battled back from an early 11-2 deficit in the second set to nearly pull even with the Trojans down the stretch. Jade Gray had a pair of timely kills and the Wildcats were helped by several attacking errors by the Trojans. Central had plenty of power up front, but struggled to dial it in late in the second set and Alpena eventually only trailed by two, 16-14. From there, Central took over the set, displaying more control at the net and was helped by three aces from Olivia Fiebing as the Trojans ended the set on a 9-1 run. With momentum firmly in hand, the Trojans faced little resistance in the final set. Central began on a 12-1 run and eventually pushed its lead to 18-4 and later 23-8. Maggie McCrary finished things off with a kill for Central’s final point of the night. Adrianna Gumtow led Alpena offensively with five kills and Gray and Kate Skiba each had four. Gray added 14 assists, Allison Precord had 17 assists and Alexis Pilarski had 16 digs. Allie DeRocher added two kills and four blocks. 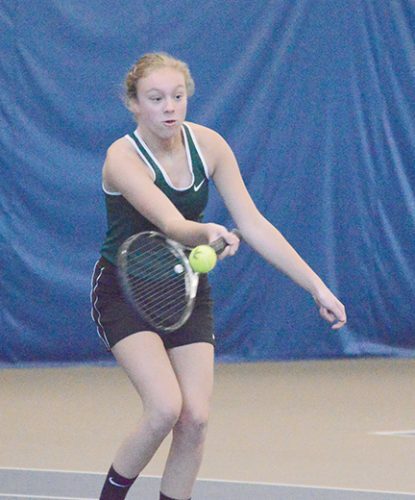 Central took a 5-1 lead early in the opening set and stretched it to 9-3 before Alpena rallied back. 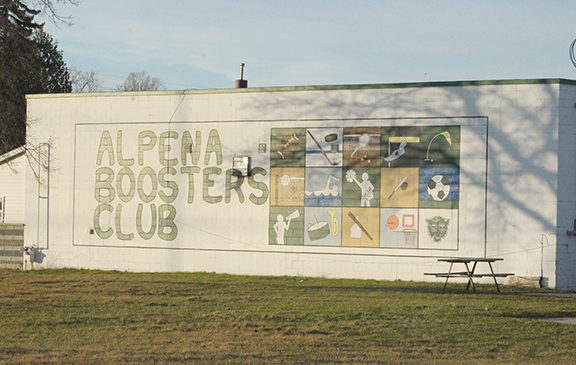 A kill and a pair of aces from Gray helped pull Alpena to within three, 9-6. 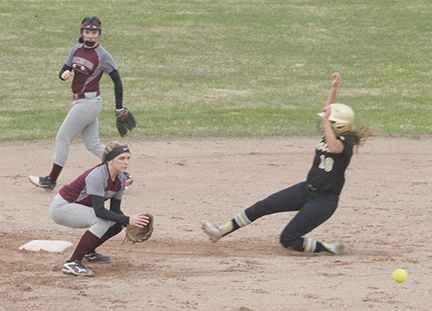 The Trojans pulled out to a 19-9 lead later in the set, but Alpena continued to fight. The Wildcats won six of the next eight points to make it 21-15, but with a sizable lead already, the Trojans were able to close out the set. Alpena’s JV team swept the Trojans 25-21, 25-18 and 25-17. James Andersen can be reached via email at sports@thealpenanews.com or by phone at 358-5694. Follow James on Twitter @ja_alpenanews.